Foosball may not be as popular as the game that it's based on, but it's a great way to pass time with some friends after a tough day. Unfortunately, the game hasn't had much luck on mobile devices in the past, with most titles being very awkward to control and play. The next app to take a crack at Foosball, however, looks to have a lot of promise. The game is free, which means that you can try it out without worrying about wasting your money, but you'll have to put up with adverts along the top of your screen whilst you play. Thankfully, they aren't intrusive like some other titles on the Play Store. In fact, once you start playing you most likely won't notice them at all. 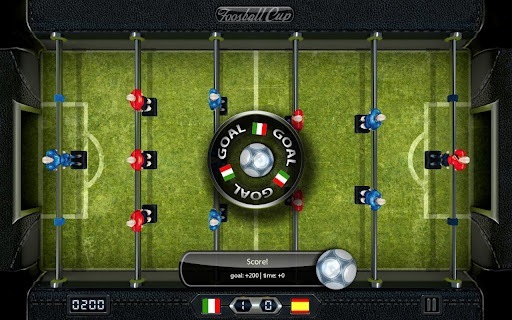 When you launch Foosball Cup, you can choose to play in one of three modes: Quick Game, Hot Seat and Tournament. In Quick Game mode, you can choose the two teams that you wish to play - one for you and one for the AI - and set your formation, the difficulty level and the number of goals the game is played to. If you're just starting out, you may want to begin on easy difficulty to get used to the controls, but you'll soon be breezing past the opposition and winning without any problems. The harder difficulties crank things up a little bit, but you may not get a proper challenge until it's on the highest of the three settings. 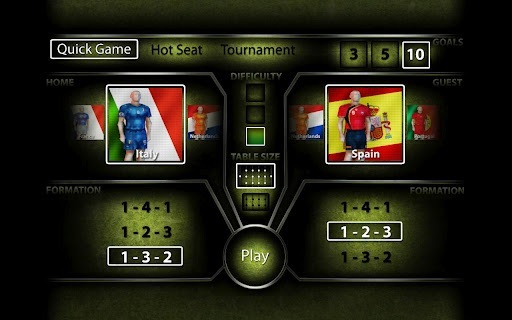 If you're playing Foosball Cup on a larger device, such as the Samsung Galaxy Note, Hot Seat mode can be a lot of fun. As the name suggests, you can play on this mode against another human player. In order for both players to be able to play at the same time in Hot Seat mode, you have to use opposite sides of the screen to control your players. This sounds fine in theory, but as the ad banner is at the top of the display on one side, there's a pretty good chance you'll accidentally hit it in a frantic rush to save the ball from passing your Goalkeeper in front of the net. This became particularly apparent as I tested the game on a phone with a 3.5-inch screen, so there wasn't much room to maneuver. In this case the bigger your screen is, the better your multiplayer experience is going to be. If you do play the game on a phone with a smaller screen, you can make the table smaller too, which is a nice touch. 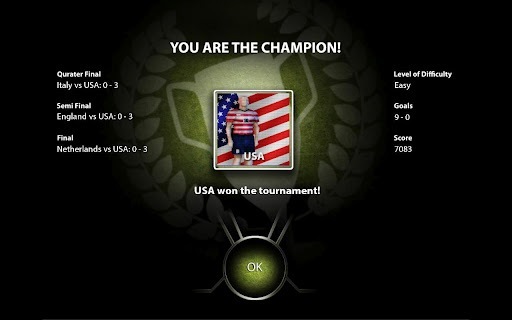 In Tournament mode, you play three matches in a knock-out scenario against randomly drawn opponents. Just like Quick Game, you can choose the difficulty level of the AI before you start, but you won't be able to change it once you're in-game, so choose the right options before hitting the Play button to avoid frustration half way through your competition! Although there are lots of countries to choose from in the main menu, the Tournament mode only lasts for three rounds using 8 countries, which isn't great if you're looking to play for a long time. I'd like to see more options added here in future updates, where you can choose the length of the tournament and maybe some more countries too; there are enough to go around. If I'm being honest, I find it difficult to control my Foosball players when I'm playing on an actual table. The very nature of the game makes it slightly awkward to get a good momentum going if you aren't used to it. In my experience, this has carried over to mobile versions of the game as well, with thin rows of players proving difficult to manage. Fortunately, the developers of Foosball Cup have made it pretty simple to control players on your team, even when working with a small screen. Dragging your finger up and down the rows of players will move the current row left and right along the table to block the ball and gain possession. To swing the players forward and kick the ball, you have to swipe your finger backwards in the opposite direction. If you haven't played Foosball before this may seem a little strange, but it's actually the same action you would use on a real table. Considering the challenges the developers have when making the game easy to control, I think they've done a pretty good job here. I grasped the controls after one or two games and soon made my way up through the difficulty levels. Throughout the game, the graphics have an arcade-like feel to them, from the 2D slider that allows you to select your team and formations on the main menu to the top down view of the action during a game. The graphics aren't particularly demanding on your phone, so as long as you're running Android 2.2 or later, you should be able to play the game without any issues. My phone handled it well, and it's two years old now. If I had one complaint about the presentation of the game, it's that the text on the main menu isn't very readable at all. Until I looked really close, I had no idea how to change the difficulty level, because the actual wording is faded so much to blend into the black background you can't even read it. Clearly, a compromise has been made to ensure that the look and feel of the game isn't affected by lots of text on the menu, but there's no point in it being there if you can't read it. It may not be the most thrilling game available on the Play Store, but if you want to take Foosball on the go with you, then Foosball Cup is the best app to do that. I'd like to see a paid version available to get rid of the ads in the game, and the readability issues in the main menu definitely need to be addressed in a future update. If these issues are fixed and more options are added to the Tournament setting of the game, then I would definitely recommend that you check it out. It's a pretty good way to kill time whilst you're getting from A to B.